The thing about stars is that there are lots of them. So many that, for fairly obvious reasons, they don’t all have names. Mostly, stars just have catalog numbers (Sirius, for example, is also known as HD 48915, IRAS 06429-1639 and IRC -20105, amongst others). So, partly because I don’t want to keep referring to a 9 digit IRAS number and partly because my supervisor asked me not to put the catalog number on the internet (we haven’t published anything on it yet), I’ve decided to give one of the stars I’m working on a nickname. This is Vermillion. 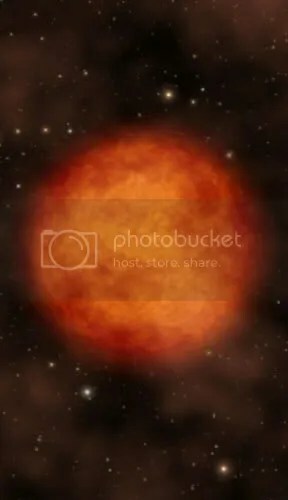 It’s a red giant carbon star (in other words, a star with more carbon than oxygen). Being a red giant, it’s also a mass losing star, and in under a billion years it’ll probably shed it’s outer layers as a planetary nebula. The image to the left is a fairly good illustration of what it might look like up close. It’s also a bit over 200,000 light years away in the Small Magellanic Cloud, a dwarf galaxy which orbits the Milky Way the same way the Moon orbits the Earth. Carbon stars are also a rich red colour, hence “Vermillion”. Other than that, I don’t actually know very much about this star. In fact, it seems like nobody does. I can’t seem to find a single paper about it. When you can’t find it on arXiv or ADS, chances are it’s either very obscure, or it doesn’t exist. I suspect in this case, no one’s really looked at this star before. So I have a whole load of freshly reduced data on Vermillion to analyse (I love the smell of freshly reduced data in the morning). I have a whole set of visible light spectra from this star to analyse. They’ve been compiled by one of our group’s collaborators at the SALT obervatory. There are a load of unusual features in there, such as a couple of unusual absorbtion bands. The other bizarre thing isn’t immediately apparent. Being an old star that’s full of carbon it shows strong C2 absorption lines. These lines are surprisingly narrow (basically, the hotter an object is, the wider the lines should be. So this is a cold star? Not exactly. It’s still extremely hot, thanks to nuclear fusion. Just not as hot as it rightfully should be. Why? That’s what I need to find out. I have some fun in store, playing with quantum mechanics and spectral line assignments. Maybe not everyone’s idea of fun, but I’ll freely admit that I’m an astronomy geek. This entry was posted in astronomy, Imported from Livejournal and tagged stars. Bookmark the permalink.